You have probably heard it before: If you are looking for online marketing success, you should engage your followers and customers. In essence, it comes down to: Increase your engagement, increase your success. But the „Why“ is often not sufficiently answered. 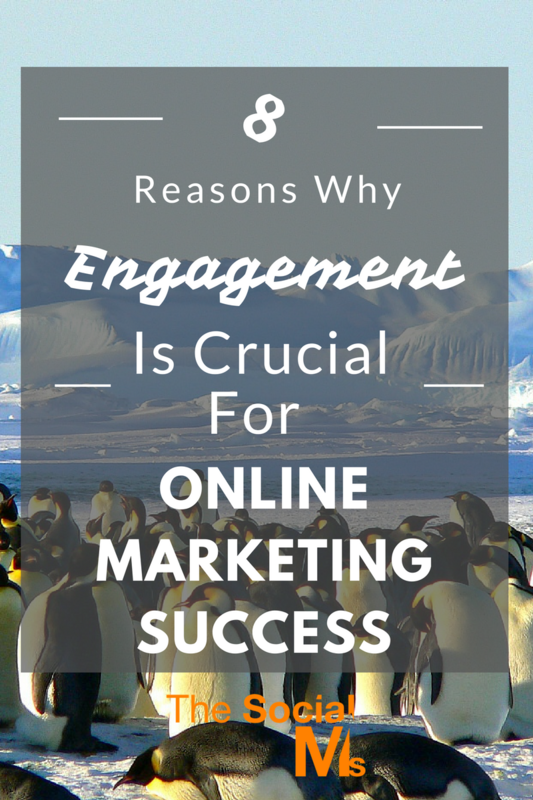 Do you know why you should engage your audience? Because Facebook will give your posts more reach if they like, comment and share your updates? True – but not the only benefit you can have from engagement. Before we talk about the benefits of engaging your audience, let us take a quick look at some numbers: How many people are actually willing to engage with a company or brand online? Will your efforts be in vain or do you have a realistic chance to get into a conversation with your audience? Here is what numbers say: over 90% of consumers are willing to engage with a brand online! 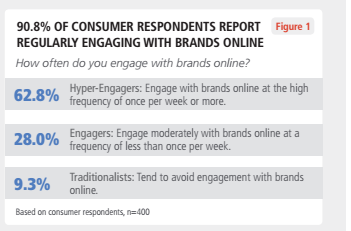 Only just over 9% of consumers say they try to avoid engagement with brands online at any cost. But, never forget: engagement is a two-way relation – do not expect your audience to do all the talking and liking. If you get the chance: join the conversation! What else can you achieve with more engagement with your audience? It is not only Facebook anymore that has an algorithm in place that decides how many and who of your Fanpage’s followers see an update you post: The more people are willing to engage with your updates the more people will see your post. Another social network with a feed that works at least partially with engagement metrics is Instagram. An engaged audience is also much more likely to „share“ your post which will give you an additional audience and help your updates to spread. From a marketing standpoint, this is what you are looking for. Ok, that one aspect of more engagement was probably more or less obvious. Most of you knew that – I expect. A mere feature list or claims of benefits without any proof often show not the best results in the form of customers and conversion metrics. Before your audience hits the buy button, they need to trust you and what you promise. Engagement, conversations, and interactions can be a most valuable tool when it comes to building trust and loyalty. People like to connect to people – not products. Show them who you are, and what they can expect from you. If you do it right and they trust you, you have a much better chance of selling anything to them. Are you afraid of a healthy discussion, afraid someone may talk back at you and question your point? Don’t be. Fear kills emotions and emotions will help you get more out of your audience. The one emotion in your audience that will kill your conversion rate and what you can get out of your audience is indifference. Low engagement often is a sign of indifference. So you got an audience to your content – and then what? Do they come back for more? Or do you have to work just as hard to bring them to your content a second time? Engagement will make you stand out, people like to be entertained and connect. Engagement can help you get more subscribers and especially in social media a discussion can easily give you a spike in new followers. When I started out with social media marketing the first spike in new followers on my Twitter account was a result from a guest post on Jeff Bullas Blog that inspired a ton of comments on his blog, in social media and some other places, too. It is not only the reach on social media that increases with engagement. Have you ever noted for yourself? Often the attention we are willing to give a social media update largely depends on the number of comments it gets. People will dwell on your updates far longer if they have additional information (or entertainment) in the comments. The same holds true for blog posts with an interesting discussion or information in the comments. I have been stuck with reading hundreds of comments on some select but awesome articles. And I can still remember which articles it were that got my attention – and the attention of hundreds of other commenters. In addition, you can use engagement and conversations in social media to access a new audience: Why not join a conversation that someone else already started. That can be a conversation on a blog or on social media. Simply be open to joining in when you come across an interesting discussion – or even monitor actively on Twitter or elsewhere for conversations on certain keywords or keyphrases from your niche. No one likes talking to robots. People like to connect to people. Show yourself and your personality and a very good place for that is the comment section of your blog, Fanpage or even on Twitter. Social media and marketing are much closer to real life than we sometimes think. The psychological processes at work are the same. And by simply remembering that we can get more out of our efforts. Be human, engage and show your personality. And while you are at it, make sure you make your audience feel important and significant. By enforcing engagement and by taking an active part in it, you can tend to the basic human need for significance and importance. Consider the last party you went to. A party where you did not know many people. Now tell me: Who of the party guests do you remember the next day? All the people you merely glanced at but never spoke to? Or the hand full that you actually talked to or had a funny encounter at the buffet or bar? It is natural. We always remember the people best that stand out. And having a nice conversation is an easy way of making yourself stand out. Make sure to engage with your audience, and they will certainly remember you better for it. 8. A buying audience is an engaged audience. 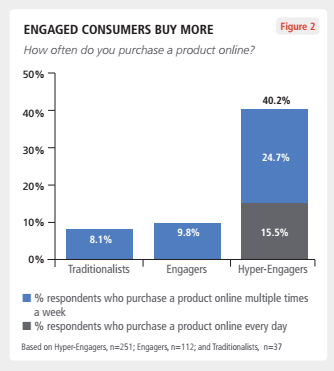 Statistics show that people are much more likely to purchase a product if they engaged with the brand beforehand. The reasons for this are manifold – they lead back to the before mentioned aspects of audience engagement. It is all about psychology and the psychologic trigge rs that you have to know and use to your advantage. You need to build trust and show your personality, you need to make people remember you and follow you so that you can keep in touch – and then, only then can you expect to turn them into customers. If you consider all of the above, you now know why engagement is such an important factor to online marketing success. But your work only just begins with it. Now you need to actively pursue engagement. In my next article, I will talk about some ways to increase engagement on your content and social media channels. Do you want to learn how to build an audience from social media, engage with it and turn the audience into leads and customers? 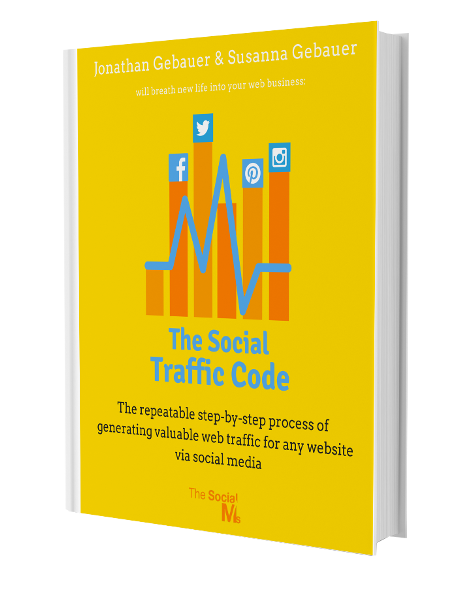 Get the ebook “The Social Traffic Code!” It will answer all your questions!